The radar return signal power is influenced by (amoungst other factors) both the specific humidity and its vertical gradient. These factors can be significant right the way up to the tropopause level but, in general, are confined to altitudes below approximately 8 km. 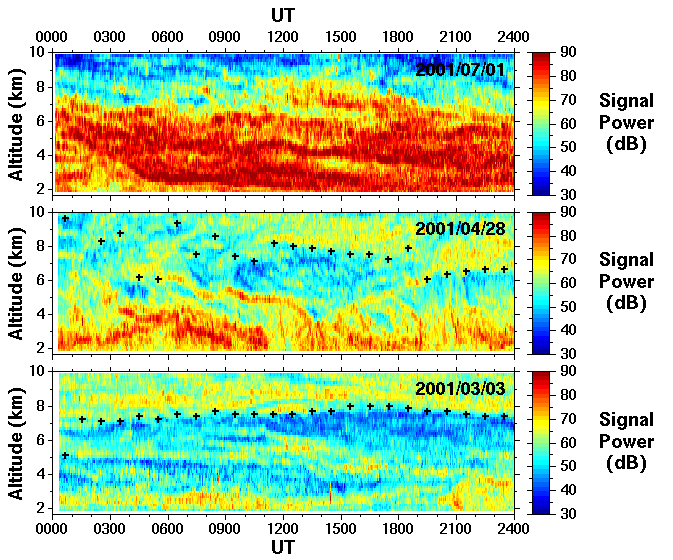 As can be seen from the examples above, the `humidity signature' typically shows a great deal of small scale structure (particularly so in the case of the middle panel) and its magnitude is highly variable. Although it is not, in general, possible to decipher this signature based on radar return signal power alone, it seems likely that it could be of use for (at least) certain cases when complementary information is available. This is a topic of on-going research. Precipitation can additionally give rise to a distinctive signature in the radar return signal power.